Can you help me identify what puzzle it is ? When I was in my brother's room I have seen a kind of grid. I don't remember it exactly but it was way smaller than a 9x9 grid. Given a white knight and a black knight in the middle of opposite sides of a 3x3 chessboard, swap them in the least amount of moves. The first number in each pair is the location of the black knight, the second is the location of the white knight. The nth line lists the positions reachable in n-1 moves, so the first line is the initial position (2,8), the second line lists the positions reachable in one move: (2,1), (2,3), (7,8), (8,9), and so on. 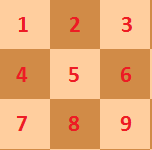 The last pair written is (8,2), which is the position in which both knights have swapped places. the central square (5) is not used. are ordered, perhaps indicating that what we have is lists of possible moves from square to square. 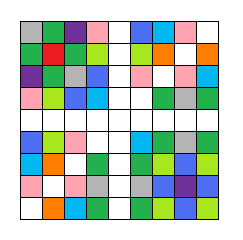 Every pair of (different) squares appears once each way around. has a lot of symmetry to it. Specifically, let A be what you get by reflecting about a vertical axis, and let B be what you get by reflecting about a horizontal axis and then reversing the order of all the pairs; then applying either of these leaves all the groups unchanged (though of course reordered). 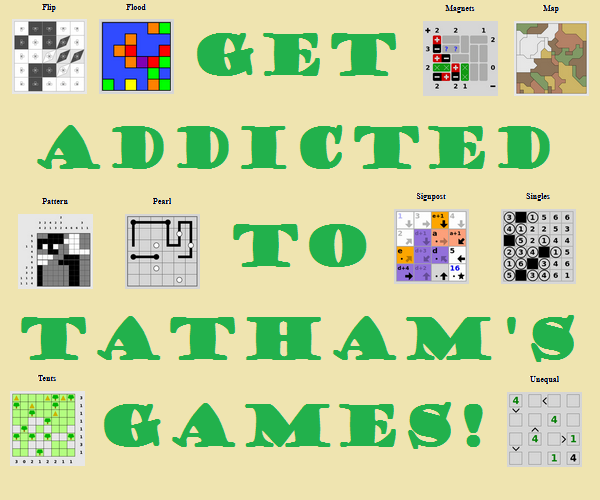 there are pieces on many of the squares and you're supposed to make them swap places or something like that. if you have knights on a 3x3 chessboard, all the 8 squares around the edge are mutually accessible and the middle square isn't -- but I don't see anything very knight's-move-y about this puzzle so I suspect there's some other explanation for the fact that the central square appears to be going unused. 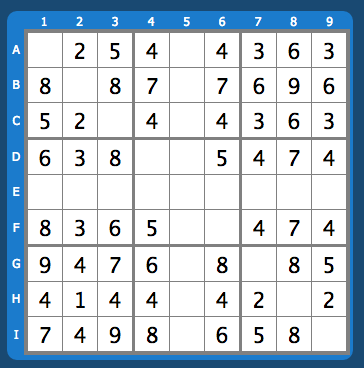 draw a 3x3 magic square with numbers 1..9, and use those numbers. the moves in each step become more consistent in direction. Specifically, if your magic square looks like 816/357/492 then the first four groups have all the "broadly SE-to-NW" moves, the fifth has the three "narrowly SW/NE" ones in both directions, and the last four have the "broadly NW-to-SE" moves. That's cute but I don't currently see its significance (if any). suppose that in that magic square you number squares by "northwestness": 432/321/210. Then the first group contains the unique move that changes this by +4; the next contains the four that change it by +3; the next contains the eight that change it by +2; the next contains the twelve that change it by +1; the next contains the three that don't change it at all. This pattern fails for the remaining groups, though. This puzzle continues to make me feel stupid. I find it easier to compare similarities with the spaces marked in number form instead of colored. Note the board I was using has the vertical axis labeled going downward, so the pattern may be flipped from existing answers (in case it makes a difference). 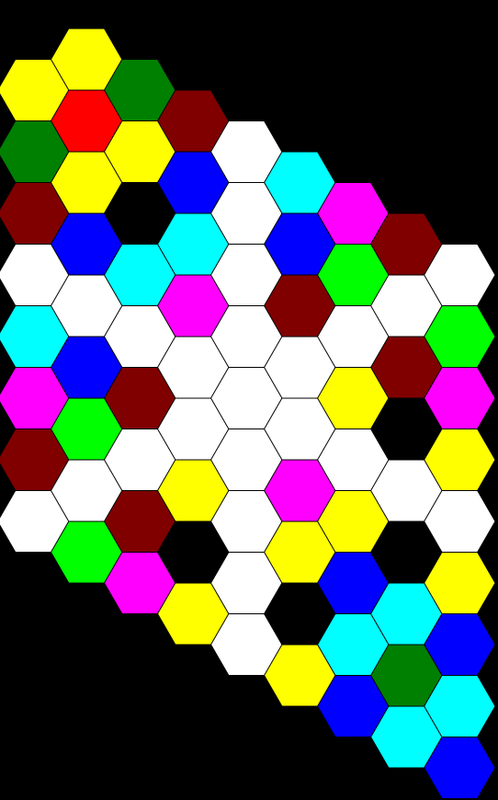 some kind of next pattern question. 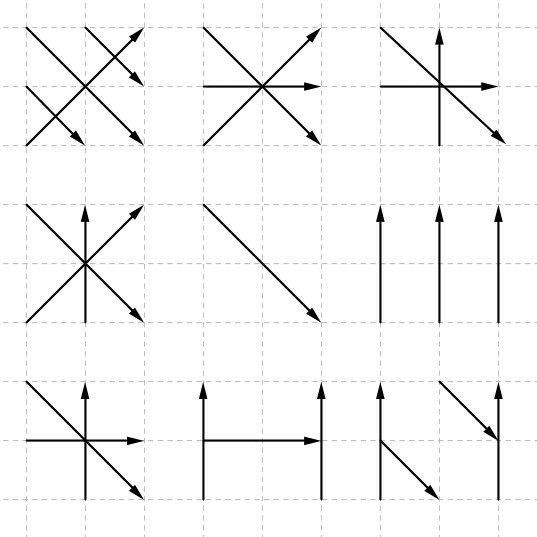 If you line up two sets of numbers from 1 to 9 and connect the sets to each other with lines based on the ordered pairs (creating graphs that look a bit like lacing up a shoe) the graphs for each line in the problem is symmetrical. In relation to the first hint two sets lined up are't a specifically a grid but if they were they could be 2x9. That's what I have so far, but it probably doesn't contribute much.